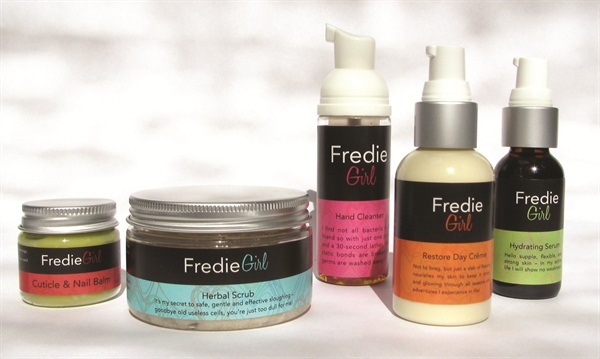 A manicurist, educator, and holistic skin care manufacturer, Sheila Fredriksen recently launched FredieGirl, a hand and foot care brand built around the needs of clients with compromised health. FredieGirl addresses a number of common skin and nail care concerns resulting from many health challenges, including cancer. Pairing holistic chemistry with active botanicals, the line poses no contraindications and is free from carcinogens, hormone disruptors, and inflammatory response triggers that interfere with skin and nail health. Products include a Hand Cleanser, Herbal Scrub, Hydrating Serum, Restore Day Crème, and Cuticle & Nail Balm. The products focus on five key areas: 1) protecting and supporting the skin’s lipid barrier to maintain hydration and moisture; 2) supporting skin elasticity (vital with edema or lymphedema); 3) reducing inflammation; 4) maintaining skin immunity by protecting the skin’s natural pH; and 5) supporting nail suppleness and tissue health to minimize breakage and bacterial intrusion. For more information, go to www.frediegirl.com.